It’s not a GoPro. I don’t like the hype around it, their physical size, and their wide view angle which are not appropriate for my use case. The form factor is excellent for my usage: it’s low profile, long and flat rather than tall and wide. At exactly 1 inch in width, it means it fits perfectly on an HO-scale flat car and it is still in the HO NMRA gage so it will fit through tunnels without having to worry about it. Can’t do that with a GoPro. The dynamic exposure is excellent, way better than I expected. It captures enough light in tunnels to make the video somewhat interesting (in other words: it’s not pitch black). There’s a narrow view mode. I don’t need a super large angle and I definitely don’t want too much barrel distortion. Hard to get the output of the camera on the spot. There’s a video-out hack over USB but that’s analog video. The only way to know if I’m filming what I want is to stop recording, move the camera, connect it via USB, download the recorded file on a laptop or tablet and look at it. Which makes the whole exercise pointless since I have to touch the camera so it can’t use that to adjust its position. Similarly, I can’t configure the exposition parameters and view the result “live”. So I just keep the defaults as they seems sort of appropriate. The lack of real time view means setting up the camera is a lot of guesswork. 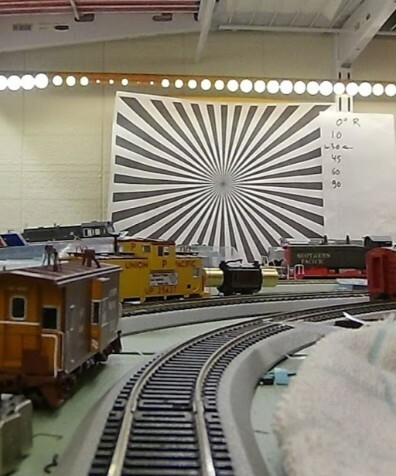 I use flat cars to hold it, but I have no idea if the freight car or engine in front is going to be visible, blurry, too high, too low… It’s just guesswork. Similarly more than once I did a recording on a layout and got confused with the buttons and then turn the recording off at the beginning of a ride and on when I stopped… oops. Gotta watch that little blinking light like a hawk. The default recording mode is rather flat (unsaturated), and for my indoor usage rather grainy. I can somewhat compensate both in post edit, but it’s nothing like the vibrant colors one gets outside in a sunny/well lit environment. Cab rides are hard to film. I don’t like looking at a lot of ceiling lights. So I often trim the 1/3rd top part out of the 1080p video to get a 720p one. All in all, the Mobius is fairly good. My only grip is the lack of real time view. There comes the Runcam 2. It’s about the same size and form factor. The Runcam 2 has wifi, yeah! It has a narrow view mode where I can reduce the view angle and get less barrel distortion. Default color seem a tad more saturated than the default Mobius (but then I could adjust that one upfront). The wifi was OKish, not as great as what I was expecting. Dynamic exposition wasn’t anything near the Mobius. It was pitch black in tunnels. And there’s the nail in the coffin, see below. So that wifi. It’s there. Ok it got the feature, but after a few seconds I was less than excited about it. It’s just so-so. Basically I can enable the wifi mode on the Runcam 2 then connect my phone to the specific wifi network it created. It’s a bit clumsy and the first time it took me a few times to get it right. Once I get used to the frustrating connection experience, it’s not that bad. The app UI can be a bit sluggish when connected, and the album navigation was a bit confusing the first time. Again, not great but nothing dramatic. Just have to get used to it, till I forget in 6 months when I pick it up again. The wifi distance cannot be too large… anything more than a 2 or 3 meters and the connection drops. The layout at Randall is particularly unfriendly to work with as it uses the 1960’s idea of using a wire mesh support for scenery. Each trip into a tunnel is like stepping into a poorly designed Faraday cage. The thing does try to reconnect, and sometimes it does succeed. The battery depleted at alarming rate when trying to record and live view at the same time. It literally lasted like 10 minutes. So forget live viewing. Still the wifi is very good to do exactly what I miss on the Mobius: setup the cam, orient it, grab a snapshot, and review it. Once I know the camera is setup as I want it, I can turn wifi off and just let it record the ride. Note that the videos and snapshots viewed in the camera app are very very compressed, so it’s hard to get fine details out of them. It is however trivial to download them on the phone and view them with the phone’s media player and zoom in. Now, the ugly. Actually the two ugly bits. It’s… blurry. Very sharp and in focus right at the nose of the camera and blurry in the distance. Apparently that’s a known issue and there are several youtube videos that show how to adjust the focus “ring”. Except it’s not really a ring, it’s just the typical compact lens with a standard thread, held in place not by a little focus screw but by generous application of glue. There’s one video out there where the owner tries to turn the lens with tongue-and-groove pliers (argh!) and then resorts to a heating gun to soften the glue… Not linking to that as it deserves no views whatsoever. However I’ll just mention the camera is extremely easy to open, and the glue on the lens thread can be carefully and gently sliced using a hobby knife at the ring circumference. Doesn’t even need to be removed. Once that’s done, it’s easy to gently turn the lens to adjust its focus and it will still keep in place. Re-assembling the camera was as trivial as opening it -- really a nice design in there. And after all that, I was able to do my cab ride with some acceptable results. It was not as sharp as I expected somehow but clearly not the blurry thing I had at first and somewhat on par with the results from the Mobius. Now the second ugly bit is the sound. The recorded sound is really muted. Imagine someone whispering with their mouth covered by a pillow while you wear earplugs and there’s a jumbo jet taking off from the airport next door. That’s the kind of muffled recording I got. Reading forums, they apparently had the reverse issue in the previous version -- exaggerated clipping and people suggested hacks placing a resistor in parallel with the mic to soften it. Now it’s the reverse. The thing is too soft. Way way too soft. I take it people are taking these cams and placing them on RC planes or drones, so there’s a lot of propeller noise. But in my case I want to record the sound of my DCC engines and all their subtlety. And let’s be clear, the Mobius does it fine when it doesn’t exactly have a better mic hardware that I can tell. Interesting to note that the Runcam 2 exports a stereo sound track… using a single mic. In the cab ride I did, I kind of salvaged that by increasing the volume by +12 dB and trying to add a filter to remove the overpowering white noise that emerged from that. It’s really not that great.